This game is exactly what the EuroCup is all about. A team that has been absent from the big game arena for quite some time faces off against a team with a strong pedigree in recent times. This Wednesday night is shaping up to be quite the evening in the Euroleague. This has been a very long time in coming but Montakit Fuenlabrada will play their first home game in the EuroCup for a period of 13 years! This means the home fans will be delighted to see this game and you can bet they will create an exciting and noisy atmosphere in this game. One player that will be very excited to take part in the action will be Marko Popovic. This is because Popovic played for Khimki and he achieved success in the tournament back in with the Russian side. Popovic has clinched the EuroCup twice in his career and his experience will come in very handy for the home team in this game and throughout the tournament. Khimki come into this game on the back of a home win, and they’ll be looking to build on that 76-71 win over Vilnius. Two of the players that made a big difference last week are Jacob Pullen and Earl Rowland, who combined for a total of 28 points in the win. Khimki are a team with plenty of experience at this level and they also showed what a strong team they were last season in the Euroleague. 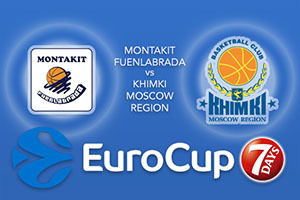 This is the sort of game that Khimki will feel they can win on the road and there is sure to be a fantastic atmosphere which can only inspire the best players to greater heights. There may not be a lot in this game but Khimki should have enough about them to do some damage. This means taking Khimki Moscow Region at -2, which is on offer at odds of 1.90 is a smart move for most basketball betting fans. If you have an interest in the Over/Under market, look to go OVER 161.5 which is provided at odds of 1.90. Bet Now!